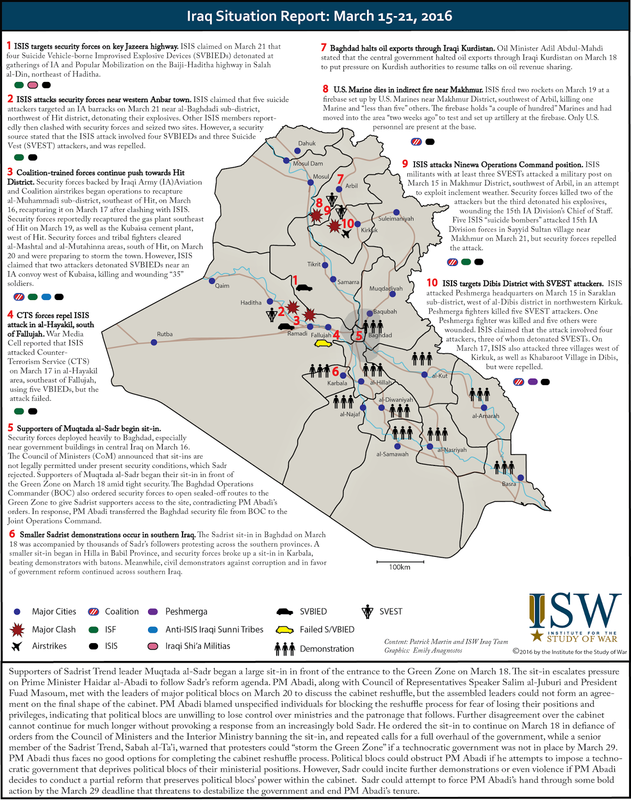 Key Take-Away: Pressure continues to mount on Prime Minister Haidar al-Abadi to reshuffle the cabinet. Sadrist Trend leader Muqtada al-Sadr gave PM Abadi until March 26 to submit the list of nominations for the new cabinet to the Council of Representatives (CoR). However, discussions underway in the pan-Shi’a political body, the National Alliance, over what positions blocs will retain in the new government stalled the reshuffle process, and PM Abadi missed the deadline as a result. 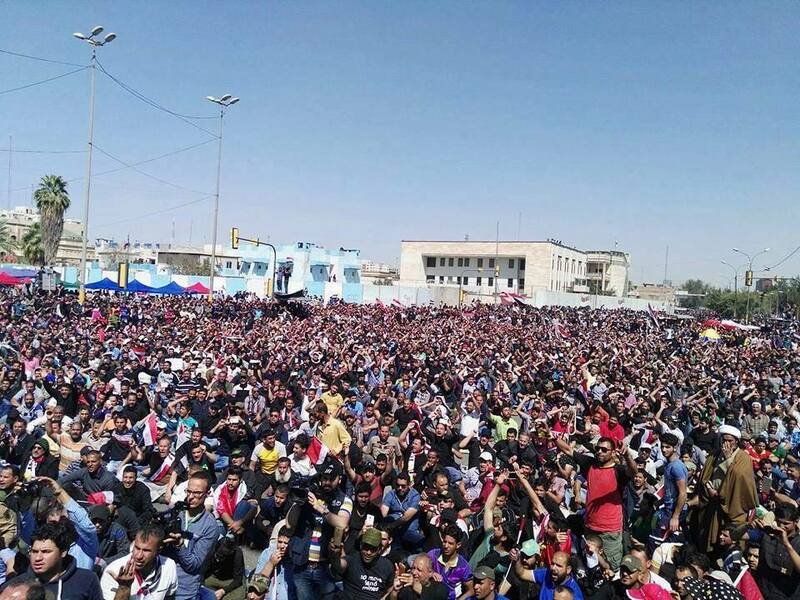 In response, Sadr initiated his own sit-in inside of a tent in the Green Zone on March 27 to pressure PM Abadi to conduct reforms, refusing to meet with politicians and government officials. Political blocs meanwhile have pressured PM Abadi to conduct reforms to their own preferences, seeking to preserve their positions and increase their representation within the cabinet. Groups like the Sunni Etihad and the Kurdistan Alliance refused to submit nominations for the new cabinet positions, citing concerns over the unclear selection process. Meanwhile, the National Alliance decided on March 27 to form a new sub-committee aimed at “advising” PM Abadi during the cabinet reshuffle process. However, the presence of Badr Organization leader Hadi al-Amiri and Popular Mobilization Commission Chairman Faleh al-Fayadh on the committee indicate that Iranian proxies are attempting to direct the final outcome of the cabinet reshuffle, an outcome that would undermine the U.S.’s ability to continue its advise-and-assist mission in Iraq and effectively combat ISIS. PM Abadi is being pulled in multiple directions by Sadr, pro-Iranian elements, and non-Shi’a political blocs in a way that makes it impossible to satisfy all parties involved. 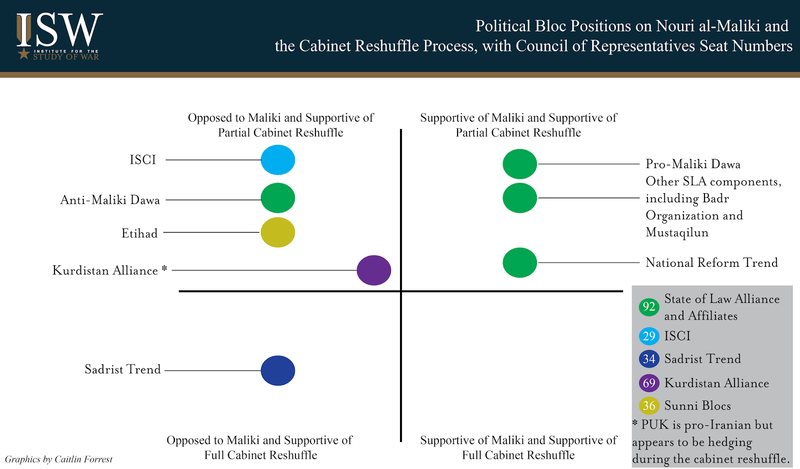 It is a distinct possibility that multiple political blocs will reject PM Abadi’s cabinet submission on Thursday, or that he may not be able to submit it at all, given the disparate demands of the political blocs. PM Abadi may thus face the real possibility of a questioning session and a subsequent vote of no-confidence if the reform process continues to stall. Pro-regime forces seized Palmyra as well as the adjacent Palmyra Airbase in Eastern Homs Province on March 27 after ISIS withdrew from the city, completing an operation that began on March 7 with the aim of recapturing the strategic crossroads. The Syrian Arab Army and its auxiliary National Defense Forces conducted multiple offensives against ISIS in the western countryside of Palmyra in the eight months after its rapid fall to ISIS in May 2015, achieving limited tactical gains at a high cost in manpower and equipment. The latest offensive proceeded as a three-pronged frontal assault similar to previous regime-directed operations against Palmyra, displaying little-to-none of the sophisticated operational design that characterized the recent campaign in Aleppo Province. Instead, the regime relied upon large numbers of reinforcements from Russia, Iran, and other foreign backers as well as a lull in combat generated by a nationwide ‘cessation of hostilities’ that began on February 27 in order to generate sufficient combat power to overwhelm ISIS in Palmyra. Russia played a major role in enabling the successful seizure of Palmyra following months of indecisive engagements. 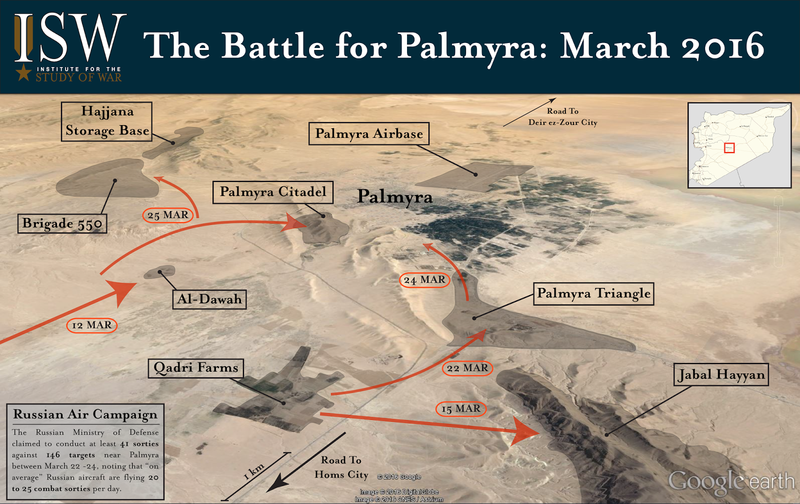 The Russian Armed Forces shifted the focus of its air campaign against Palmyra and its environs in March 2016 despite a drawdown announced by Russian President Vladimir Putin on March 14. The Russian Ministry of Defense claimed to conduct at least 41 sorties against 146 targets near Palmyra between March 22 and March 24 alone, while local activists reported that the constant aerial bombardment has destroyed up to fifty percent of the city. Russia paired its air campaign with a significant deployment of ground forces. ISIS claimed to kill up to five Russian Spetznaz personnel west of Palmyra on March 18 and posted images appearing to show one of the men standing in front of the symbol of the Russian Main Intelligence Directorate (GRU). Russia later confirmed that at least one special forces officer died near Palmyra while “directing airstrikes onto terrorist targets” near Palmyra. Media reports also revealed the deployment of Russian TOS-1 and BM-30 ‘Smerch’ heavy multiple rocket launcher systems as well as Mi-24 ‘Hind’ helicopter gunships in support of operations to seize Palmyra. The regime also received significant reinforcements on the ground in Eastern Homs Province in recent weeks, allegedly raising the total number of participants in the operation to over five thousand personnel. Activists noted that the offensive included hundreds of fighters from Lebanese Hezbollah, Iraqi Shi’a Militias, and the Afghan Shi’a Liwa al-Fatimiyoun. The death of a member of the Islamic Revolutionary Guard Corps near Palmyra on March 16 suggests that Iran also deployed its own ground forces in order to oversee its coalition of proxy forces in the operation. Meanwhile, the regime deployed a convoy of up to one thousand Syrian Marines and pro-regime militiamen from the Syrian Coast to Eastern Homs Province on March 18. These redeployments were enabled in part by the ongoing ‘cessation of hostilities’ which allowed the regime and its allies to withdraw troops from its frontlines with opposition groups in Latakia, Aleppo, and Quneitra Provinces without major risk. The fall of Palmyra represents a major victory on the international stage for both Syrian President Bashar al-Assad and Russian President Vladimir Putin. The new gains allow the Russian-Iranian-Syrian coalition to claim a significant win in the fight against ISIS, bolstering its narrative as the ideal partner in the anti-ISIS campaign. This message may stand to gain additional traction within Europe in the aftermath of a major terrorist attack by ISIS in Brussels, Belgium on March that killed thirty-one civilians and wounded several hundred others. The advance also bolsters the current position of strength held by Syrian President Bashar al-Assad amidst the ongoing Geneva III Talks to end the Syrian Civil War. The seizure of Palmyra curtails the ability of ISIS to project force into Western Syria from its safe haven along the Euphrates River Valley and provides a much-needed buffer for several critical regime-held oil and natural gas fields that provide electricity to Western Syria. The regime and its allies will likely leverage Palmyra and its military facilities as an optimal forward position for follow-on operations against ISIS in Ar-Raqqa and Deir ez-Zour Cities, complicating the position of the U.S.-led coalition in the region. ISIS is using its foreign fighters and safe haven in Iraq and Syria to execute a terror campaign within Europe. ISIS’s March 22 Brussels attacks support a larger strategy to punish, destabilize, and polarize the West. ISIS will likely continue to attempt attacks in France and Belgium in 2016, using its large Francophone foreign fighter population and local supporters. ISIS’s support networks in southern Europe may enable ISIS’s operatives to launch operations in other parts of the continent, including Austria, Germany, Spain, and Italy. ISIS may also increasingly target Westerners in Turkey in order to punish members of the anti-ISIS coalition and undermine the Turkish economy, as part of its stated objective to seize Constantinople. Current efforts to address these threats through law enforcement, surgical strikes on ISIS’s leadership, and linear attrition of ISIS’s terrain and resources are necessary but not sufficient to destroy the ISIS threat to Europe. The anti-ISIS coalition must deprive ISIS of its primary source of strength, its territorial control as a caliphate in Iraq, Syria, and now Libya. ISIS’s suicide bombings in Brussels demonstrate that the jihadist threat to Europe is outpacing domestic and international law enforcement efforts. ISIS is successfully using its safe haven in Iraq and Syria to train as many as 600 foreign fighters for external attacks. ISIS’s fighters benefit from extensive support networks across the European continent. The logistical requirements for facilitating European foreign fighter travel into Iraq and Syria can also export those fighters from ISIS’s safe havens back to Europe. Reports following the November 2015 Paris attacks and the recent Brussels attacks indicate European governments have incomplete, fragmented intelligence on the identity and communications of ISIS’s members in Europe. ISIS likely retains attack cells and logistical networks within Europe that will enable it to launch additional spectacular attacks, with support from the organization’s leadership within Iraq and Syria. 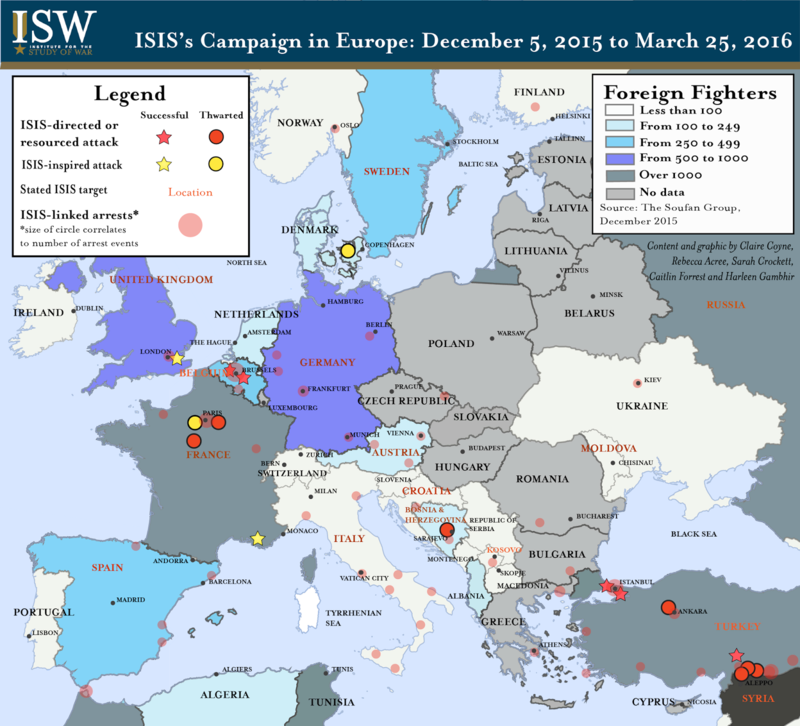 ISW last published its ISIS’s Campaign in Europe map on December 2015. The graphic below updates that visualization to depict all attacks inspired or coordinated by ISIS in Europe from January 2014 to present. This group includes attempted and successful attacks in the United Kingdom, France, Belgium, the Netherlands, Germany, Spain, Bosnia, Kosovo, and Turkey. The graphic also marks locations where ISIS-linked individuals have been arrested in that timeframe. Locations with more than two arrest events are depicted with opaque circles with varying sizes depending on the number of events. Events that occurred at an unspecified location within a country are marked on that country’s capitol. 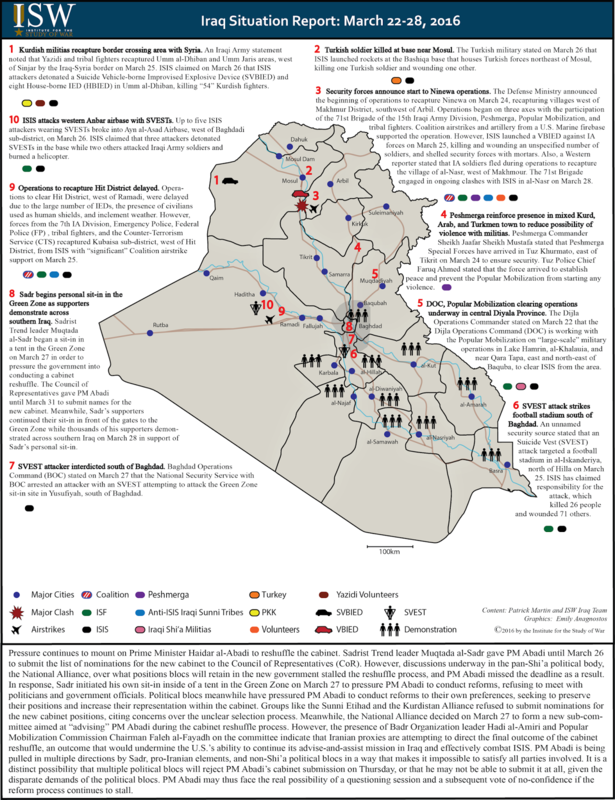 The graphic also highlights where ISIS has directed public threats or recruitment calls. Individuals inspired by and responsive to ISIS are active across Europe, particularly in France, Belgium, Germany, and the United Kingdom. ISIS-linked attacks and arrests in Europe are distinct from ISIS’s activity in Turkey, which reflects spillover from ISIS's campaigns in Iraq and Syria as well as ISIS's campaign to attack the West. ISIS also aims to destabilize Europe more broadly through spectacular attacks. ISIS seeks to exacerbate tensions between European states, raise defensive requirements within those states, cause an environment of fear, and inflict additional economic damage on Europe. An official ISIS media outlet affirmed each of these operational objectives in a publication released January 2016. 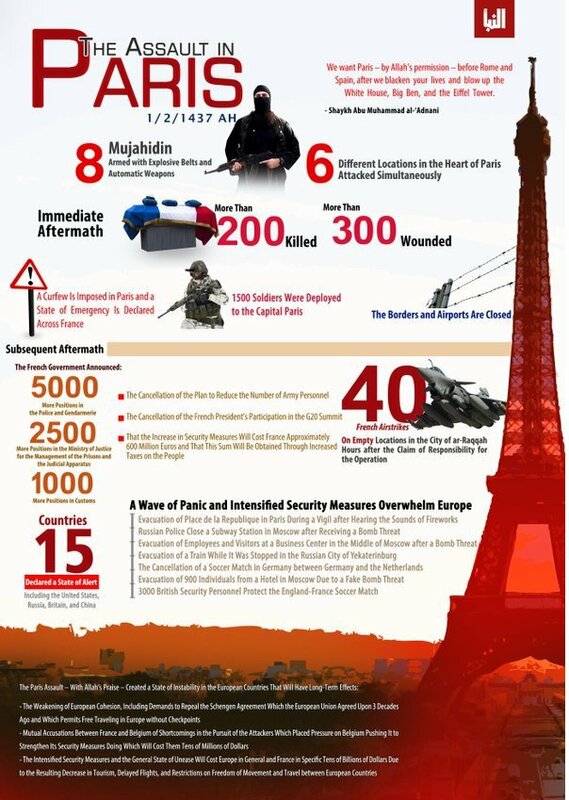 The graphic claimed the November 2015 Paris attacks “[weakened] European cohesion” and caused “demands to repeal the Schengen Agreement.” It also argued that the Paris attacks caused tension between France and Belgium over intelligence failures. It celebrated how the attacks created a “general state of unease” and predicted that decreased tourism revenues and increased security requirements would cost Europe “tens of billions of dollars.” ISIS’s directed and inspired attacks set conditions for the organization’s desired apocalyptic war by draining resources and exacerbating internal conflict in the West. ISIS’s attacks and resultant European disunity will undermine efforts to address the regional refugee crisis, as demonstrated by Poland’s decision on March 23 to renege on a plan to settle 7,000 refugees from Syria and Eritrea. The crisis will likely intensify over the next year. Refugee inflow on the Mediterranean from January to March 2016 increased more than sevenfold as compared to the same period in 2015. Russia may also be encouraging migration to Europe to exacerbate this problem, according to NATO Supreme Commander General Philip Breedlove and Estonian President Toomas Hendrik Ilves. Increasing pressure on European security and cohesion will open opportunities for both Russia and ISIS to expand influence. ISIS particularly aims to destabilize Europe through polarization, which it calls “destroying the grayzone.” ISIS hopes attacks in its name will provoke state and social backlash against Europe’s Muslim communities, encouraging radicalization and jihadist recruitment. Such reactions have already surfaced from the Brussels attacks, as Dutch far-right leader Geert Wilders called to “de-Islamize the West” and as American presidential candidates suggested patrolling Muslim neighborhoods and banning Muslims from entering the U.S. ISIS will likely exploit these actions in order to claim it is the defender of Muslims in a broader cultural war. ISIS is best positioned to launch attacks within France and Belgium due to in part to its large Francophone foreign fighter population. An estimated 1700 French citizens and 470 Belgian citizens are fighting in Syria, with the latter representing the largest per capita amount of any Western nation. ISIS’s Francophone fighters reportedly formed cohesive fighting units with Syria, likely forming the basis of attack cells deployed back to Europe. These operatives recruit and gain logistical support from their home networks in France and Belgium. Authorities have thwarted several attack plots linked to or inspired by ISIS in France and Belgium since December 2015, reflecting an enduring jihadist support base within those countries. The ISIS network responsible for the Paris and Brussels attacks demonstrated resiliency and adaptiveness over past months through the ability of Paris attacker Salah Abdeslam to go undetected and the progression to the group’s first large explosive attack in Brussels on March 22. ISIS likely maintains attack cells within France and Belgium and will continue to attempt spectacular attacks on soft targets in those countries over coming months in order to replicate the success of its previous attacks. European authorities may locate and detain some of this network through intelligence gained from Salah Abdeslam, but ISIS will likely balance this loss with new European recruits. ISIS also retains pre-existing recruitment networks in Spain, Italy and the Balkans, as demonstrated by arrest patterns in 2016. This group will likely continue to provide financial and logistical support to individuals seeking to join ISIS in Syria, Iraq, and Libya. ISIS’s recruitment networks in Spain may increasingly orient towards Libya, where ISIS’s affiliate controls terrain and operates training camps. This affiliate could attempt to strike Europe, possibly exploiting migrant flow to Europe to do so. ISIS’s networks in Italy and the Balkans could aid this effort, as those countries host major migrant entry points. German and Austrian authorities arrested alleged ISIS operatives in refugee shelters since December 2015, confirming that ISIS members are intentionally using refugee transit to enter Europe. ISIS likely does so in order to strengthen xenophobic organizations and rhetoric in Europe, thereby fueling anti-Muslim sentiment and encouraging cultural polarization. ISIS shifted its attack campaign in Turkey in 2016, possibly in order to discourage Turkish efforts to curb ISIS’s foreign fighter flows. ISIS already faces potential disruption of its primary supply route to Turkey due to U.S.-backed Syrian Democratic Forces (SDF) and Kurdish PYD gains in northern Syria. ISIS may intend to incite broader conflict within Turkey in order to forestall this development. ISIS has increasingly struck foreign, tourism-related targets in Turkey, a shift from its attacks against political and military targets from July to December 2015. An alleged ISIS operative launched a suicide attack near Istanbul’s Blue Mosque on January 12, killing twelve German and one Peruvian tourists. An ISIS-linked individual launched another suicide attack on a popular shopping area of Istanbul on March 19, killing one Iranian and three Israeli citizens. Strengthening European law enforcement and intelligence capabilities will only address one element of the ISIS threat to Europe. Programs to counter ISIS’s message, its finances, and other capabilities will assist, but will not suffice. ISIS’s safe haven within Iraq, Syria, and now Libya will continue to provide the logistical infrastructure necessary to train, resource, and direct attack cells in Europe. 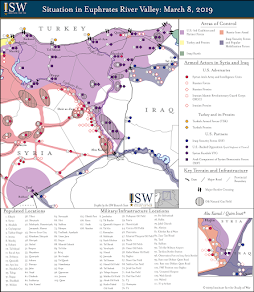 The anti-ISIS coalition must deprive ISIS of its territorial control as a caliphate, which is its primary source of strength, in order to destroy the ISIS threat to Europe. Key Take-Away: Supporters of Sadrist Trend leader Muqtada al-Sadr began a large sit-in in front of the entrance to the Green Zone on March 18. 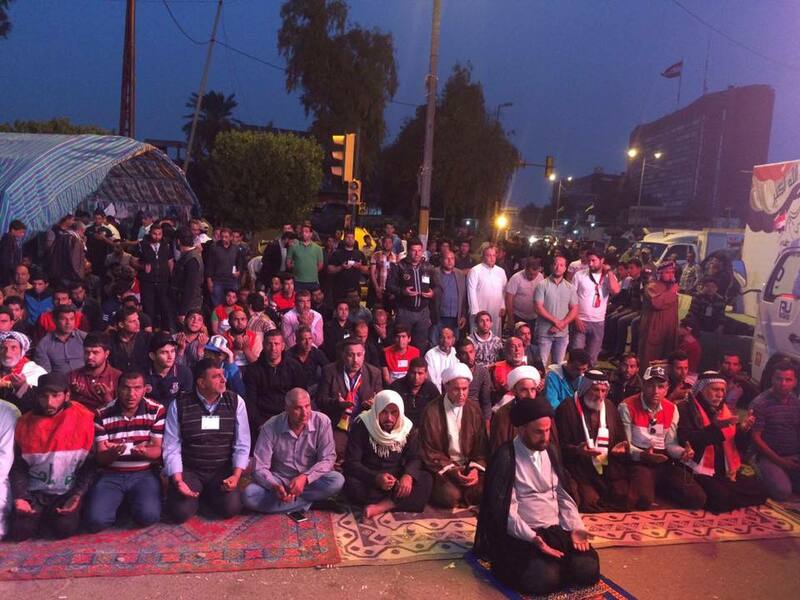 The sit-in escalates pressure on Prime Minister Haidar al-Abadi to follow Sadr’s reform agenda. PM Abadi, along with Council of Representatives Speaker Salim al-Juburi and President Fuad Masoum, met with the leaders of major political blocs on March 20 to discuss the cabinet reshuffle, but the assembled leaders could not form an agreement on the final shape of the cabinet. PM Abadi blamed unspecified individuals for blocking the reshuffle process for fear of losing their positions and privileges, indicating that political blocs are unwilling to lose control over ministries and the patronage that follows. Further disagreement over the cabinet cannot continue for much longer without provoking a response from an increasingly bold Sadr. He ordered the sit-in to continue on March 18 in defiance of orders from the Council of Ministers and the Interior Ministry banning the sit-in, and repeated calls for a full overhaul of the government, while a senior member of the Sadrist Trend, Sabah al-Ta’i, warned that protesters could “storm the Green Zone” if a technocratic government was not in place by March 29. PM Abadi thus faces no good options for completing the cabinet reshuffle process. Political blocs could obstruct PM Abadi if he attempts to impose a technocratic government that deprives political blocs of their ministerial positions. However, Sadr could incite further demonstrations or even violence if PM Abadi decides to conduct a partial reform that preserves political blocs’ power within the cabinet. Sadr could attempt to force PM Abadi’s hand through some bold action by the March 29 deadline that threatens to destabilize the government and end PM Abadi’s tenure. Russia and its proxies have escalated operations involving re-deployed heavy weapons in eastern Ukraine in February and March in order to set conditions for future operations and to test the levels of escalation the international community is willing to overlook. Russian-backed separatists likely intend to target multiple pressure points in order to stretch Ukrainian forces along the separatists’ western front in an attempt to disguise their intentions about which single position they intend to prioritize. Specifically, separatists based around Donetsk city, who had concentrated fire on government positions to its west in February, redirected their attacks north of the stronghold in early March. Separatists escalated attacks on Avdiivka, north of Donetsk city, firing rare heavy artillery, tanks, and mortars and clashing with Ukrainian troops starting March 4. Separatists also launched “Grad” multiple launch rocket systems (MLRS), banned from the front line by the “Minsk II” ceasefire agreement, west of Donetsk airport on March 3 and on February 16, showing their intention to escalate the conflict despite the ceasefire. Despite a mid-February withdrawal of separatist forces from a long-contested village east of Mariupol, separatists increased the scope of indirect fire attacks on Ukrainian positions east and northeast of the strategic port city. The tandem escalation of attacks in close proximity to the most populated government-controlled city in the region and Donetsk city may increase pressure on the Ukrainian government to make political concessions tied to the “Minsk II” ceasefire agreement, including recognizing the special legal status of occupied Donbas, in an effort to deescalate the conflict. The unenforced “Minsk II” ceasefire agreement grants Western leaders an attractive non-military response to limiting Russian aggression through negotiations, supported by strict U.S. and European economic sanctions. The “Minsk II” agreement, however, has allowed Russia to expand its political and military leverage over Ukraine. Russia is a belligerent posing as a mediator and can increase and decrease violence in order to coerce Ukraine into concessions. President Putin continues to blame hostilities along the front line on the Ukrainian authorities’ failure to uphold political obligations under the “Minsk II” ceasefire. European leaders’ support for maintaining sanctions may be weakening; the German and French economy ministers have made statements this year supporting the lifting of sanctions in the near term. The foreign ministers of Germany and France, who may prioritize the resolution of the Syrian Civil War over the war in eastern Ukraine, recently expressed hope that Ukraine would allow elections to be held in occupied Donbas by June 2016. 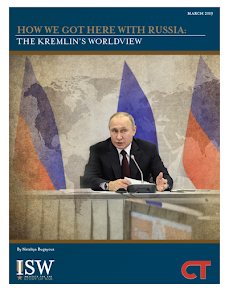 Putin is taking steps to change political as well as military realities on the ground. The separatist “Donetsk People’s Republic” (DNR) began issuing its own passports on March 16, a landmark in Russian-backed efforts to transform the occupied regions of Donetsk and Luhansk oblasts into polities. The leaders of the DNR claimed the passports would be required to participate in local elections in the occupied region, thereby excluding internally displaced persons and pro-Ukrainian individuals from the vote. Despite Russia publically not recognizing the DNR as an independent state, the move may have been approved by President Putin to undermine Western-backed efforts to arrange elections in occupied territory in accordance with Ukrainian law and OSCE standards. Russia will likely support political and military escalation in eastern Ukraine in the coming months while painting Kyiv as the spoiler of the ceasefire. Russian-backed separatists will continue to gradually escalate indirect fire attacks on Ukrainian positions and shift operations along the front near Donetsk city and Mariupol. Russia may privately support preparations for separatist pseudo-elections in 2016 in an attempt to bolster the legitimacy of its proxies. 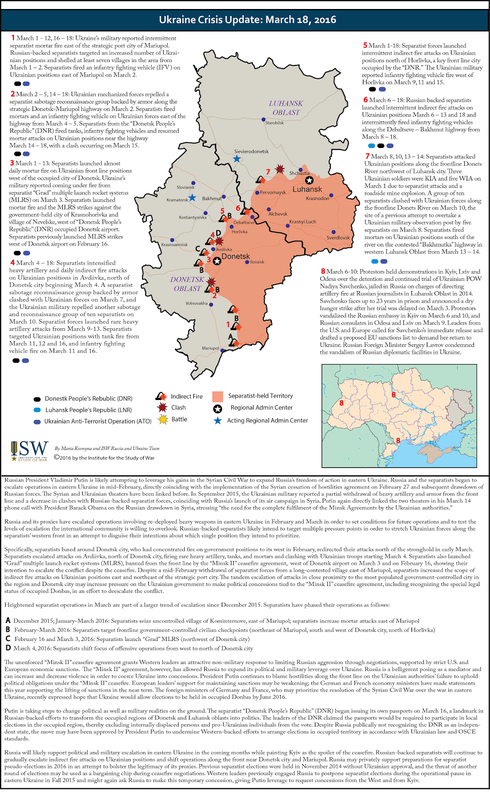 Previous separatist elections were held in November 2014 without Ukrainian approval, and the threat of another round of elections may be used as a bargaining chip during ceasefire negotiations. Western leaders previously engaged Russia to postpone separatist elections during the operational pause in eastern Ukraine in Fall 2015 and might again ask Russia to make this temporary concession, giving Putin leverage to request concessions from the West and from Kyiv.